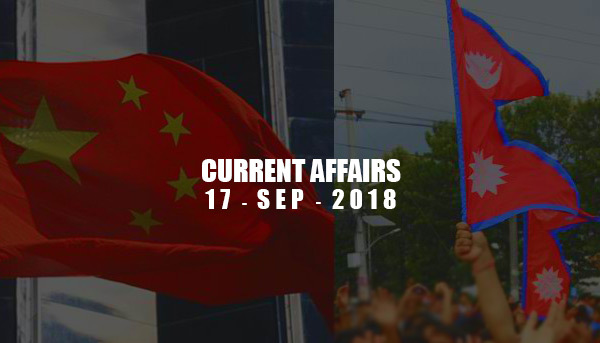 Current Affairs - Sep 17, 2018 - IAS - Daily Current Affairs, IAS Syllabus Exam Strategy, IAS Preparation. ISRO has successfully launched two earth observation satellites NovaSAR and S1-4, weighing 450kg each into Sun Synchronous Orbit. ISRO has used PSLV-C42 (Polar Satellite Launch Vehicle - C42) rocket to send these satellites of United Kingdom. It was 44th mission of PSLV. These satellites are synthetic Aperture radar and high-resolution optical earth observation satellites aimed at imaging, surveying resources, forest mapping, land use, ice cap, flood n disaster monitoring, urban management etc. The satellites belong to UK-based Surrey Satellite Technology Limited. Nepal-China began its 12-day long Military Exercise 'Mt. Everest Friendship Exercise'. It is the second edition of Nepal-China military drill. It is being organized in China's Sichuan province. Indo-Nepal battalion-level military exercise is known as ‘Surya Kiran’. Under the Ministry of Statistics and Programme Implementation (MoSPI), Member of Parliament Local Area Development Scheme (MPLADS) funded and administered. In this scheme, every MP is allocated Rs.5 crore per year in their constituency. Central Information Commission (CIC) in its recent report has highlighted that Rs.12,000 crore of MPLADS remains unspent. CIC has aksed Lok Sabha Speaker and the Rajya Sabha Chairman to come out with a legal framework to ensure accountability of parliamentarians and political parties for their obligations under the scheme. Boxers Simranjit Kaur (64kg), Monika (48kg) and Bhagyabati Kachari (81kg) won gold medals at the Ahmet Comert Tournament in Istanbul, Turkey. An indigenously DRDO developed low weight Man Portable Anti-Tank Guided Missile (MPATGM) was successfully flight tested for the second time from Ahmednagar test range. It will complement Israel made Spike Anti-Tank Guided Missile. The Jaipur Literature Festival began in Houston at the Asia Society of Texas on 14th September 2018.